Star Trek Discovery has its fair share of fan theories and Easter eggs. Like any other iteration of the show, viewers have poured over the details to try and find clues about what might happen next, or to dig up secrets from below the surface of the story. It’s worth noting now that spoilers follow, so read at your own peril. The most popular theory right now surrounds Voq and Ash Tyler, the Starfleet prisoner who escapes with Lorca at the end of episode 5 - Choose Your Pain. Many fans think that Voq is Tyler, and that he’s all set to infiltrate the Discovery. Sounds mad? Read on and I’ll explain the whole theory. First of all let’s talk about Ash Tyler. 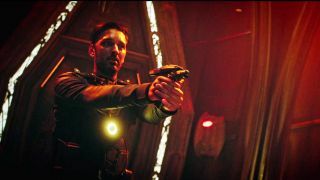 Played by Shazad Latif, he was heavily flagged as a main character before Star Trek aired, in all the pre-release marketing, AND he appears in the main title sequence along with the rest of the prominent players. It’s unusual for a show to introduce a main character late on in the run, and Tyler first surfaces in episode 5, but that wouldn’t be hugely suspicious in itself because Discovery is a split-season so it's relatively long. Latif was originally cast as Klingon Officer Kol, but switched to play Ash Tyler at some point during the show’s relatively troubled production. Again, this is circumstantial and does happen relatively often, but it adds an air of suspicion to his current role. Now let’s look at Voq. He’s played by an actor listed as Javid Iqbal, and according to IMDB this is his only role in TV or movies. His profile doesn’t even list an actor headshot, but a picture of Voq in all his Klingon glory. How strange. Iqbal could easily be publicity shy, or looking to spoil another twist later in the show, but his profile is very unusual. This has lead some to speculate that Latif is actually playing Voq, and that Javid Iqbal is just a fake name used by the showrunners to cover up the real identity of the actor portraying Voq. So, why do many think Latif is the one assuming this role? Beyond the fact he was originally slated to play a Klingon? Take a look at this video. The facial similarities are very striking, and the eyes look incredibly similar too. It’s tough to tell these things beneath such a thick layer of make-up, but it’s equally not hugely far-fetched. Now let’s look at Voq again. Last we saw he’d been stranded on the wreckage of the USS Shenzhou, and rescued by L’Rell, who promised to take him to see the House of Mokai and show him “things he never knew possible”. Interestingly, Voq hasn't appeared again during the rest of season 1 (part 1). It’s also hugely notable that the captain of the prison vessel in Choose Your Pain just happens to be L’Rell, and that she is descended from a family of spies - the House of Mokai. Even more intriguingly, Voq was leafing through all the Starfleet crew information at the end of episode 4, gathering knowledge of his enemies… or looking for a potential disguise. If Ash Tyler existed and died on the Shenzhu, Lorca wouldn’t have known him as it wasn’t his command. However, that leaves the small matter of the Klingon Voq transforming into the human Tyler. It’s very feasible that Lorca’s capture and escape could have been orchestrated as a means for getting Tyler on board the Discovery - he does appear to get off the ship with relative ease - but how could Voq become a human? At the end of episode 4 Voq is told that the House of Mokai would be able to help him get vengeance but that it would cost him “everything”. Given his humble beginnings, and the fact he has lost both his ship and all his allies, the only thing Voq has left to lose is his Klingon identity. And becoming human would certainly achieve that. Is it possible? The mid-section of the final episode of season 1 pt1 (Into The Forest I Go) sees Tyler reunited with an imprisoned L'Rell, causing him to have some kind of PTSD-style flashback and leaving him incapable of helping Admiral Cornwell. We see what could be his torture on the Klingon prison vessel... or what is more likely, his very physical transformation from Voq to Tyler. At the end of the episode Tyler has a vivid dream about L'Rell, and visits her in the brig of the Discovery. He asks: "What did you do to me?" to which she replies (in English): "Do not worry. I will never let them hurt you. Soon." Either she's still treating him as her pet or she's foreshadowing Tyler's transformation back into Voq. The idea of Klingons becoming human actually has precedent in Star Trek. In the original series, which is set chronologically after Discovery, we encounter a Klingon spy who has disguised himself as a human. How is that done? It’s all down to something called the Augment Virus, which causes any Klingon exposed to lose their distinctive head-ridges and sharp edges, making them appear very much human. The Augment Virus was introduced in the Enterprise series, which was looking for a canonical way to explain the fact that the Klingons in the original Star Trek didn’t have the same head-ridges and fangs as the ones we know from later iterations and the movies. Why would Klingons want that? The Augment Virus was a Klingon experiment to genetically create their own versions of Khan (who they saw as a ‘human weapon’), but the side effect is that it made the race appear human, which would otherwise be a real shame on them. In reality, the Klingons just looked like hairy humans in the original Star Trek because make-up budgets were lower, but because Enterprise is set before that show chronologically it needed to explain away the discrepancies. Enjoy that history lesson? If you followed it then you can see where all this is going. With a bit of language training, body conditioning, and exposure to the Augment Virus… it’s very possible that the House of Mokai managed to transform Voq into Tyler. They had six weeks to do it, which seems like a short time, but it’s also very possible (and this could be the deliberate reason the showrunners left such a large chronological gap between episodes 4 and 5). Choose Your Pain presents that large gap of six weeks as a reason to explain the deterioration of the Tardigrade but… we now know that creature to be something of a MacGuffin, as it is released into space at the end of the episode. Pulling it all together, then. We have a mysterious actor playing Voq and another ‘main character’ listed in the credits of the first four episodes having apparently not appeared in them. We have Tyler conveniently escaping beatings and fleeing with Lorca to board Discovery. We also have Voq missing from episode 5 onwards after being taken to a Klingon House capable of showing him “things he never knew possible”, with L’Rell as the captain of the prison ship Tyler was held on. On top of that we see L'Rell again in multiple episodes without Voq, and we see Tyler having flashbacks about extreme body torture or conditioning. And we have precedent for Klingons appearing human in previous versions of Star Trek. Suddenly, the idea that Voq is Tyler isn’t so far fetched, and it’d be a lovely twist in a show that has already demonstrated the smarts to make Star Trek feel thoroughly modern and relevant in a TV culture that delights in plot-twists and big reveals. Not so great for Burnham, however, who is rather fond of Tyler and has already gotten physical with him. Star Trek Discovery starts its second half of season 1 on January 7.